The United States has parted ways with the United Nations Human Rights Council. The news came from U.S. Ambassador to the United Nations Nikki Haley and U.S. Secretary of State Mike Pompeo. In a 14 minute 30 second joint statement before the press at the State Department, both diplomats painted a harsh picture, leveled scathing criticism at the rights council and gave America’s reasons for withdrawing membership in the Geneva, Switzerland-based organization. “We take this step because our commitment does not allow us to remain a part of a hypocritical and self-serving organization that makes a mockery of human rights,” said Ms. Haley June 19. The UN ambassador and Trump administration hawk at the United Nations threatened a year earlier to leave the council if certain reforms weren’t met. Both Mr. Pompeo and Ms. Haley accused the council of practicing heavy-handed and unfair bias against U.S. ally Israel and freely allowing membership of nations guilty of human rights violations. They named China, Cuba and Venezuela as examples. The Human Rights Council is an inter-governmental body within the United Nations system. The 47-member group was established in 2006 with a mandate for the promotion and protection of human rights around the globe. “It’s unfortunate that the U.S. has pulled out,” said Paul Kawika Martin, senior director of policy and political affairs at Peace Action, a grassroots peace network. Mr. Martin said the U.S. has had a significant presence on the council. Mr. Martin doesn’t anticipate the U.S. desertion significantly affecting the body. “It’s certainly not some sort of a death blow … this is just one president’s decision,” observed Mr. Martin. Mr. Pompeo, who until recently was chief over the Central Intelligence Agency, said the U.S. has no opposition in principle to multilateral bodies working to protect human rights. “But when organizations undermine our national interests and our allies, we will not be complicit,” Mr. Pompeo said. “When they seek to infringe on our national sovereignty, we will not be silent,” he added. The move came one day after the opening of the council’s 38th Session on June 18 in Geneva where the U.S. drew condemnation for its immigration policy that separated children from undocumented families crossing its southern border with Mexico. In opening remarks at the session, the UN High Commissioner for Human Rights Zeid Ra’ad Al- Hussein addressed growing concern that the “no tolerance” policy was a violation of the universal rights of children. While speaking about rights violations, Mr. Al-Hussein called on the U.S. not to hinder transparency and access to border areas by any special rapporteurs investigating abuse claims. He also called on the U.S. to become a signatory to the international Convention on the Rights of the Child. Nearly 2,000 children were forcibly separated from their parents. The American Association of Pediatrics called the cruel practice “government-sanctioned child abuse” which may cause “irreparable harm,” with “lifelong consequences,” he pointed out. Inflicting such abuse on children as a deterrent to immigration is “unconscionable,” he said. He demanded the U.S. end the practice. Meanwhile, President Donald Trump signed a June 20 Executive Order to keep migrating families together, but the measure fell short of providing a clear reconnection strategy for children already separated. Rights activists say the stated reasons for exiting the council highlights Washington’s own hypocrisy. 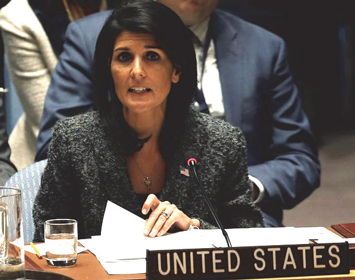 Ms. Haley emphasized the move was an answer to “chronic bias against Israel” and five resolutions the council voted on earlier this year addressing Israeli abuses. But some observers disagreed, saying Israel is a smokescreen to cover U.S. rights issues. “The departure of the U.S. from the Human Rights Council had very little to do with Israel. This is part of the U.S. deciding under the Trump administration that it wanted to be free of all external constraints on its behavior,” said Ajamu Baraka, national organizer for the Black Alliance for Peace. The U.S. understood within the UN body, particularly from the rights council, there would be continued critique and criticism of the U.S. rights violations that it has always carefully tried to shield, the veteran human rights activist pointed out. “They have now set a very strong signal, not only to the UN, but to the world, that the U.S. is now officially a rogue state,” said Mr. Baraka. America decided it’s not going to play by any of the international rules and systems of laws that are in place and used the bias claim on Israel as their departure point, he continued. “But, those of us that follow human rights issues are not really that surprised,” he added. Part of the reason Ms. Haley gave for the U.S. quitting, besides accusing the council of undue bias toward Israel, was the failure to sway the council to prohibit countries like the Democratic Republic of the Congo joining— which critics say is a double standard. The U.S. maintains close relations with several noted rights abusers like Saudi Arabia and other Gulf states, Egypt and now North Korea. The U.S. calls itself a champion of rights while giving unconstrained, uncritical support to Israel—which has been widely condemned for brutal and systematic rights violations against the Palestinian people. “But even more importantly, international opinion identifies the U.S. as being in fact, the number one violator of human rights on the planet,” said Mr. Baraka. Some American contradictions that advocates raised were the use of drone technology that has killed innocent people worldwide and using torture at secret CIA black prison sites in different countries. “There’s a long list of issues that we have in our own country,” added Mr. Martin. The huge prison population of two million people, the disproportionate killings and use of excessive force against people of color and the proliferation of arms and the death penalty were listed as other criticisms. The overall response at the 38th Session to Washington’s decision from members of the council was moving to fill the vacant seat and going forward. Slovenia’s President Borut Pahor agreed and told the council that both the body and the U.S. are diminished by the decision. “The Human Rights Council without the USA will be weaker, but also endeavors of the USA in protecting and promoting human rights throughout the world will be weaker as well,” said President Pahor.